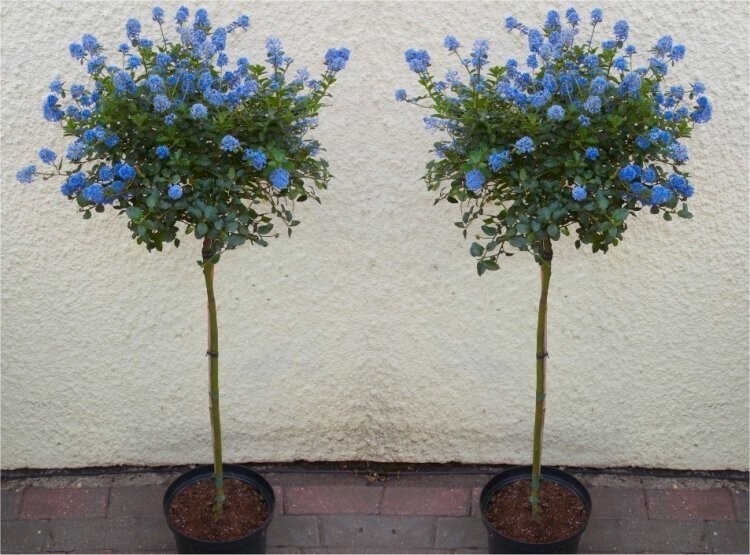 These Ceanothus trees are ideal in a pot on the patio, simply clip the head of foliage to keep in shape and maintain a smart topiary look. Normally only offered as a bush, we have limited quantities of these available as a stunning standard tree. A long, clear stem supports a bushy lollipop head of foliage that bursts into colour in early Summer. Fluffy, blue blooms will cover the head of the tree, creating a spectacular display for many weeks. Very easily pruned into shape to keep bushy and rounded. Keep in moist, well-drained soil in a nice bright position, and these will really reward you. Perfect for patio planters, these can be planted in a situation where they are easy to admire, they can be grown and kept in the same way as a standard bay tree. Clip regularly for compact head of foliage, but remember not to trim too early each year, and you'll enjoy the dazzling display of blue flowers. Tough, hardy and drought tolerate once established, these will look marvelous in any setting. Strong plants, with a clear stem, topped with foliage are supplied as pictured with an overall height of around 100cms, full of gorgeous buds and flowers in season.